In ARK: Survival Evolved, you must unlock engrams to crafting various objects and weapons. For this, however, you need XP, and therefore, it is helpful if you can know how to level up fast and farm experience points. addexperience 1000 0 0 - With this cheat code you'll get 1,000 extra XP that allows you to level up fast in the game. cheat addexperience 1000 0 0 - This cheat allows you to level up faste in Multiplayer. To activate it, you must first enter EnableCheats and then the admin password. Most veterans in Gaming are not relying on cheats and glitches. 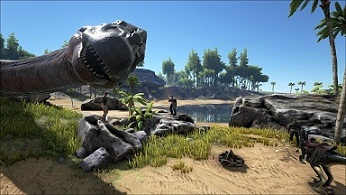 Instead, they look for the challenge in the game, and there are plenty in the ARK: Survival Evolved. So you can level up fast in a usual way, we have summarized some useful tips that will help you in this regard. Early in the game you will already be rewarded for the dismantling of resources and the production of objects with XP. Later in the game these will no longer be enough. T-Rex: Have you managed to tame a T-Rex, you get the opportunity to let him fight against other dinosaurs. In this way you get all the good XP and can also level up pretty quickly. But make sure that your wild animal does not die. Tribes: In multiplayer, it's easier to earn experience points fast if you follow a Tribe. So you will receive half of the XP of other relatives. Building parts: By crafting the parts of the building you get a lot of XP, but consumed your resources. So weighs up what you need more. Small pets: On the beach you will find many little animals - killing quickly many of them, you will get plenty of XP. Use them for best spears or slingshots. Items produced: By making certain items in ARK: Survival Evolved, you will get a lot of experience points and can level up quickly. Particularly useful prove to be Narcotic, Spark Powder and cementing paste. For farm of berries you can tame a Stegosaurus, Triceratops or Brontosaurus - they will help you in this.